AIDS has never been a laughing matter — unless you were a senior staffer in Ronald Reagan&apos;s White House. The Republican administration&apos;s anemic response to the public health crisis that claimed 61,816 lives under its watch has been well documented. But few realize that the White House&apos;s initial response to the deaths of tens of thousands of Americans wasn&apos;t just something to ignore — it was something to joke about. Q: Larry, does the President have any reaction to the announcement [from] the Centers for Disease Control in Atlanta that AIDS is now an epidemic and [they] have over 600 cases? Q: Over a third of them have died. It&apos;s known as the "gay plague." [LAUGHTER] No, it is. It&apos;s a pretty serious thing that one in every three people that get this have died. And I wondered if the President is aware of it? Speakes: No, I don&apos;t know anything about it, Lester. Q: Does the President? Does anybody in the White House know about this epidemic, Larry? 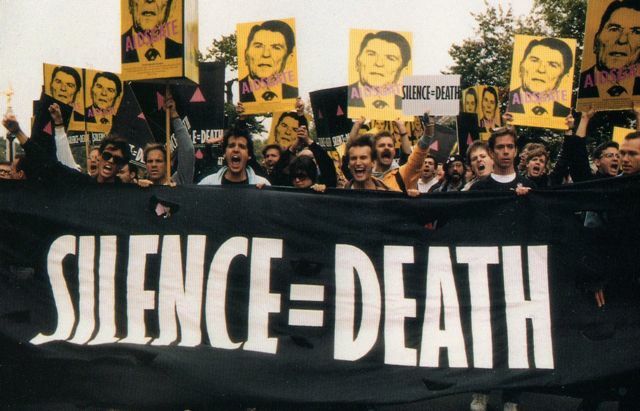 This wasn&apos;t the only time AIDS was a punchline for the Reagan White House. In 1986, Reagan suggested at a White House meeting that Libyan dictator Moammar Gadhafi, who was rumored in the West to enjoy dressing in women&apos;s clothes, should be sent to San Francisco since "he likes to dress up so much." This was the closest Reagan would come to mentioning either gays or AIDS for nearly two more years. Secretary of State George Shultz followed in the frivolity by asking, "Why don&apos;t we give him AIDS?" On another "humorous" occasion, at the centenary rededication of the Statue of Liberty, Reagan and Nancy Reagan, seated next to French President François Mitterrand and his wife Danielle, were watching the evening&apos;s entertainment, Bob Hope, give a series of one-liners. In the middle of his set, Hope quipped, "I just heard that the Statue of Liberty has AIDS, but she doesn&apos;t know if she got it from the mouth of the Hudson or the Staten Island Fairy." As television cameras panned the audience for a reaction shot, the Mitterands looked appalled. The Reagans, however, were laughing. While Speakes made jokes to the press corps and Reagan gaybashed dictators, other members of the White House&apos;s public health and policy teams were doing concrete damage to Americans with AIDS. On June 23, 1986, the Justice Department decided that an employer could legally fire employees with AIDS — or even those perceived as having the disease — if other employees feared infection. 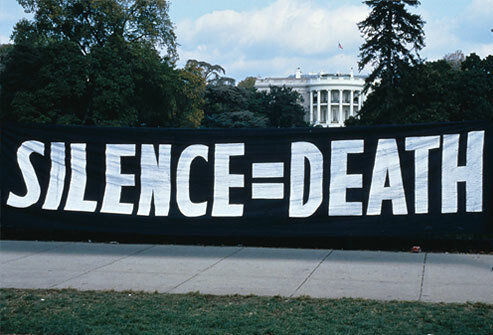 When it came to funding, the Reagan administration resisted taking any action that could be mistaken for properly addressing the AIDS crisis. Although the Centers for Disease Control and Prevention identified AIDS in 1981, research on AIDS at the National Institute of Health did not begin until 1983. The administration never budgeted money for AIDS service or research of any kind in 1982 or 1983; it was only through acts of Congress that any money was allocated at all. The following year, the administration asked for $39 million — Congress approved $61 million. But AIDS also brought out the best in people. While those in power publicly hemmed and hawed about funding or prevention and privately condemned America&apos;s "deviants" to lonely deaths, dramas of courage and reconciliation played out across the country. Lovers stayed with their dying partners until the moment of their deaths; nurses and hospice workers provided comfort to people most politicians would never enter the same room with; parents crowded around the hospital beds of their dying sons; scientists fought for money in a race to discover something that would stop the plague; and gay activists tirelessly worked to pressure any kind of action out of the government that they could. In the face of uncaring bureaucracy or ideological condemnation, they soldiered on against the plague. The work of these men and women, who were not content to let thousands of Americans lie down and wait to die, is the bittersweet double-legacy of Reagan&apos;s inaction.